Qualitative assessment of myocardial perfusion can quickly detect the presence of a flow-limiting stenosis, but cannot reliably differentiate between a 50% stenosis and a 70% stenosis. Differentiating between varying degrees of coronary stenosis may be a useful tool for monitoring treatment response. 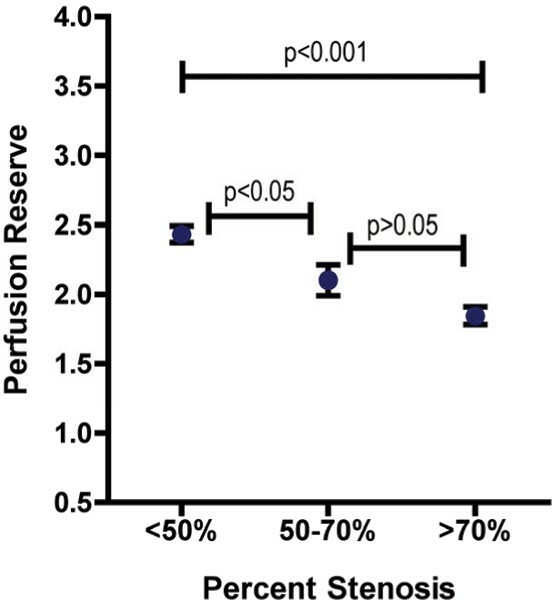 We hypothesize that quantitative measurement of perfusion reserve (PR) can be used to differentiate 50% stenoses from 70% stenoses. Forty-one patients with an abnormal nuclear stress test referred for x-ray angiography (XA) underwent dual bolus CMR imaging (DB-CMR). All CMR studies were performed at 1.5 Tesla on either a Sonata or Avanto MRI scanner with a 14 × 28 cm flexible surface coil. During and 10 minutes after infusion of 140 μg/kg/min adenosine, back-to-back boluses of gadolinium-DTPA were infused at 4 mL/s to quantify arterial input function (AIF) (0.0075 mM/kg) and first pass tissue perfusion (0.075 mM/kg). During the first pass of each bolus, 3 short axis slices were imaged using a hybrid gradient echo/echo planar imaging sequence (number of slices = 3, a nonselective 90° saturation pulse followed by an 80 ms delay, field of view = 340 – 400 × 212 – 360 mm, matrix = 128 × 80, slice thickness = 8 mm, flip angle = 25°, TR = 5.6–6.2 ms, TE = 1.3 ms, echo train length = 4, and TSENSE (n = 23)). A modified AHA 16 segment model (apex excluded) was used for qualitative analysis (QA) and measurement of quantitative PR. PR was measured using Fermi function deconvolution analysis. Quantitative XA was considered the gold standard, and all coronary artery stenoses >50% (CAS > 50%) and >70% (CAS > 70%) were assigned to the appropriate segments. Seventy-one percent of the population had at least one CAS > 50%. Late gadolinium enhancement was present in 44%, 29% had previous revascularization, hypertension (83%), and diabetes (27%). One patient refused XA and 1 had poor image quality. Of the remaining 39 patients, DB-CMR was unsuccessful in 10 (26%) due to inadequate AIF, gating, or Gd clearance prior to resting perfusion imaging. In the 29 patients with studies evaluable by both methods, the mean ± SE segmental PR decreased in a stepwise fashion (See Figure 1), 2.43 ± 0.06, 2.10 ± 0.11, and 1.85 ± 0.06 for CAS < 50%, CAS 50–70%, and CAS > 70% respectively, (p < 0.001). The best PR cutoff value for detecting CAS > 70% (n = 18) was PR < 1.55; whereas, the best cutoff value for detecting CAS > 50% (n = 23) was <1.85. Quantitative PR had a similar diagnostic accuracy for detecting CAS > 70% and CAS > 50% (respectively, 76% and 79%). On the other hand, the diagnostic accuracy of qualitative interpretation was worse for detecting CAS > 70% than for detecting CAS > 50% (respectively, 69% and 79%). When compared to qualitative interpretation, the use of quantitative PR analysis improved the specificity of detecting CAS > 70% from 55% to 73% without reducing the sensitivity (See Table 1). Both qualitative myocardial perfusion and quantitative measurement of perfusion reserve can be used to detect the presence of significant coronary artery stenosis. We show that quantitative perfusion reserve analysis, additionally, can be used to differentiate moderate from severe coronary stenosis. DB-CMR is technically challenging, but it allows for the simultaneous quantitative and qualitative assessment of perfusion reserve. When compared to qualitative assessment, quantitative perfusion reserve analysis improves the diagnostic accuracy and the specificity for detecting CAS > 70%. Another advantage of quantification is the ability to differentiate moderate from severe coronary stenosis. By adjusting the perfusion reserve cutoff value, DB-CMR can identify a pre-specified severity of coronary stenosis. The ability to measure and follow perfusion reserve may have important implications for monitoring treatment response.